Frosty and his buddy Sandy. 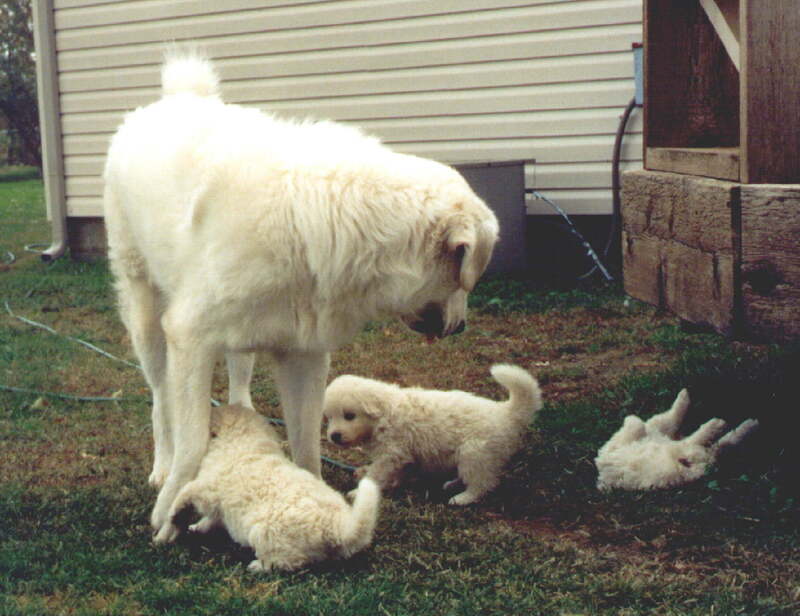 I could not show Frosty when he was young, he knew he could get away with stuff with Mom so Sandy started showing him. He showed much better for her cos he knew she wouldn't stand for any horseplay. As Sandy always said, She taught Frosty that liver was better than mom. Frosty, about 8 here. With Bubba, they were great friends, Bubba worshiped his big brother. Which turned into a handsome old senior. He is about 10 here. Playing with Christy's puppies. Frosty is around 2 here. Dr. Frosty doing what he does best. When a puppy starts teething, or in Taz's case, when the bacteria in the folds of her mouth get out of control, Dr. Frosty steps in to clean the mouth. Here's him cleaning Taz. 's mouth. Frosty and Bubba at bedtime. It was clear from our first meeting that Frosty was meant to be a guard dog. 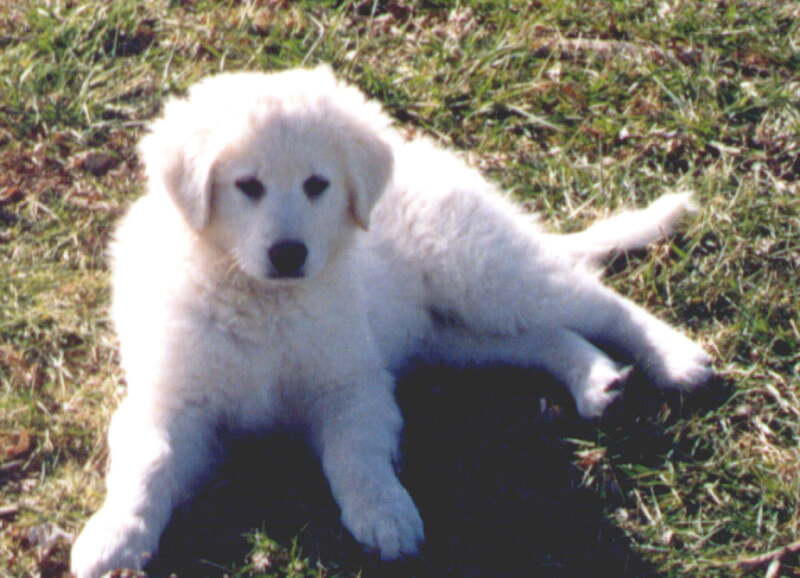 Not that he was all that ‘guardy’, but he was bold as brass, even as a puppy. There was not a situation that he would not stride into, legs straight, chest out, and head high. The night he first arrived, when we first opened the crate from the airport, the other dogs were barking and raising Cain along the fence. He bounced out and marched over to inspect them and exchange sniffs without a hint of hesitation, as though they were waiting as expected to welcome him. 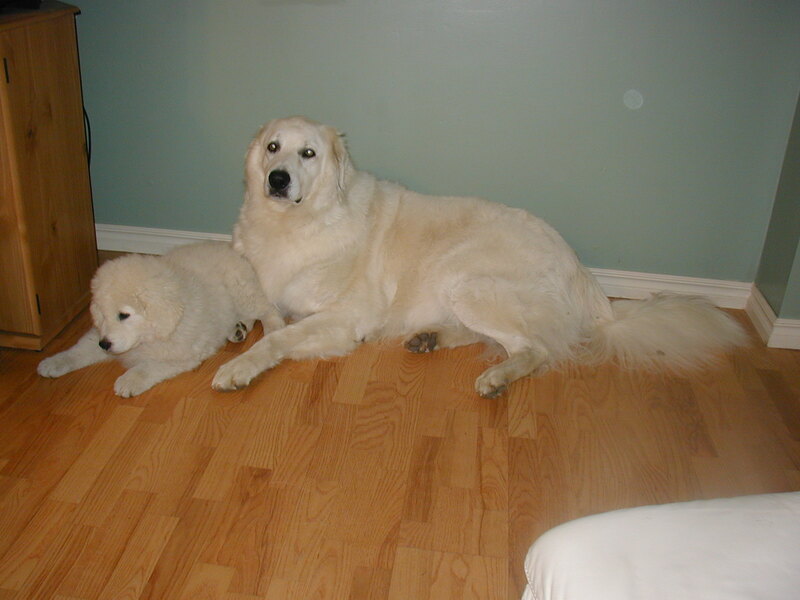 Also, even as a puppy, he lumbered. I do not think I ever saw Frosty ‘scamper’. From his youngest, he had sort of a rolling swagger, all chest and that big head. 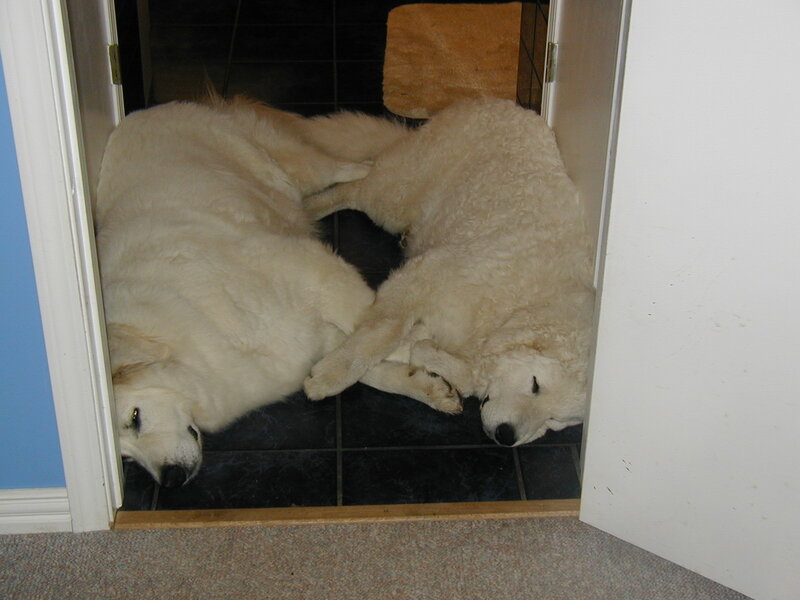 Later, that big head (and matching huge black nose) looked more than a little like a polar bear in among our other dogs. As an adult, he would not actually roar into action, going after real or imagined intruders in full attack mode. He would bark and lumber off in their direction, letting lesser beings handle the initial rush and showy stuff, while he did his best Marshall Dillon routine, coming on with the relentlessness of the tide to deal with things if they went that far. Only once do we recall Frosty losing his bravado. 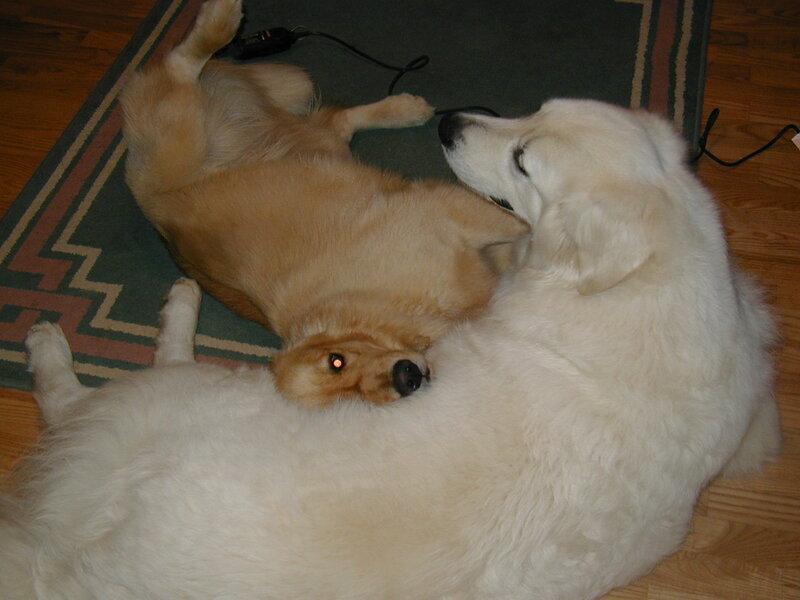 As a puppy, Pam took him to the office to meet people. A co-worker, Mark came out to meet him, jumped at him, and yelled “HOW YA DOING FROSTY?? !” in his face. Frosty turned tail, ran and hid behind a tree, peeking out at Mark. To this day, Mark regrets scaring the puppy. In terms of guarding, there were a couple of biting incidents over the years; not vicious ones but more of someone not taking Frosty seriously combined with his tendency to be ‘mouthy’. They seemed to come as much of a surprise to Frosty as to the victims, and to make him very abashed (‘Oh, I’ve done it now; I’m sorry, so sorry; now I’m in trouble.). 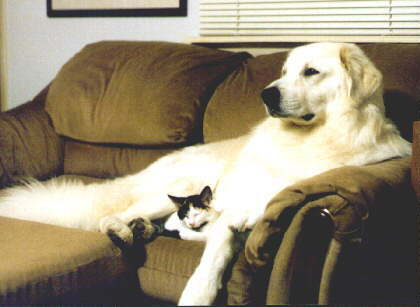 Actually, in spite of being such a large, burly puppy that grew into a large, burly dog, we nearly lost him as a puppy. Frosty was hit hard by a tenacious bout of parvo, one that might well have killed a less stout (or less stubborn) puppy. It kept him at the vet’s quite a while, living on i.v. fluids. 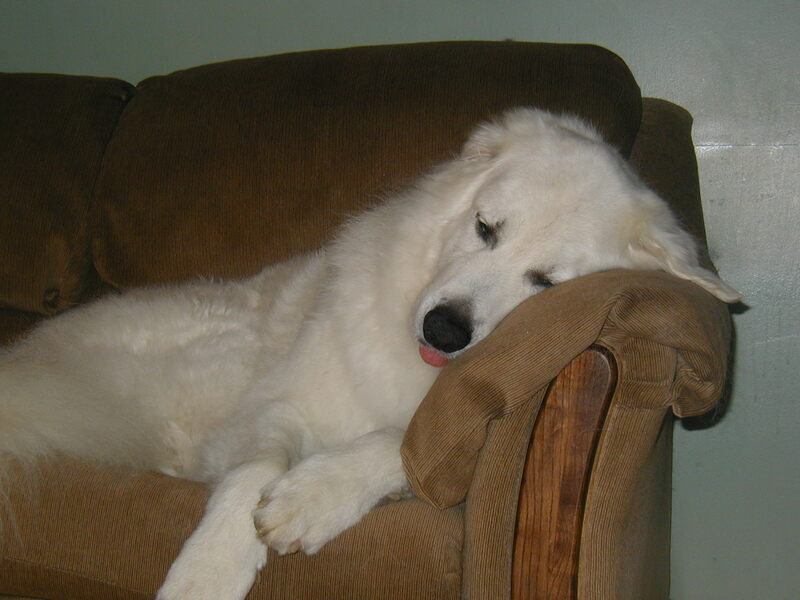 The only residual effect of the parvo was Frosty never really learned to play. Throughout his life, play to him was to simply bark while the others were bouncing around wrestling and so on. He loved dog shows, and loved being a therapy dog. Getting out a lead and saying “Do you want to be a ‘terapy’ dog?” always resulted in a bouncing, bumping, grinning moose, pushing to the front of the pack. And in a completely different dog. At another therapy visit, when Pam and he were sitting in a room with several patients, one had a granddaughter visiting him who had physical problems of her own, apparently some sort of neurological disorder. Although Frosty would always lay by Pam, this time he got up, went over, and laid down next to the little girl for the duration of the visit. 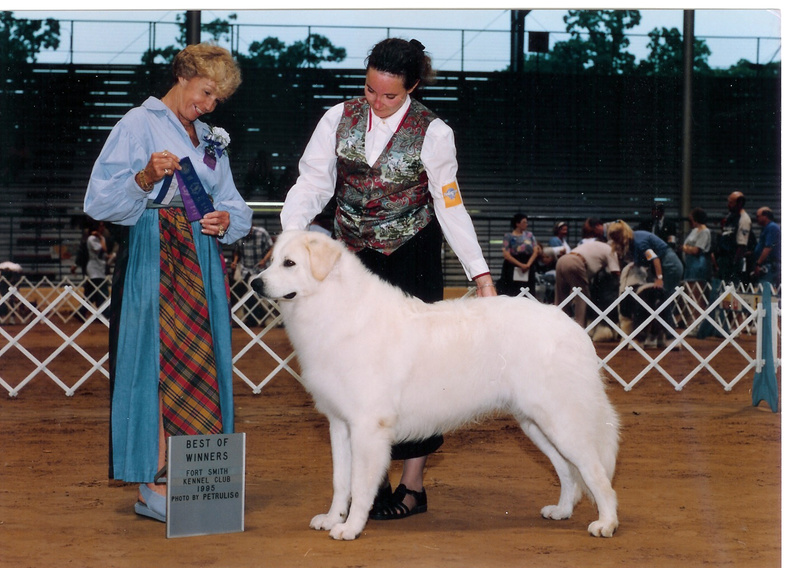 And once, at a dog show, Pam was talking to someone and not paying attention to him on his lead with her. When she turned back to him, here he was, grinning like a goose as usual, with kids hanging on him like tree ornaments. He was also a good pack member. He did little to show it, but he was very aware of his relation to the other members of our pack over the years. So much so that when, over the years, another dog would occasionally die, Frosty would get literally physically sick a week or so afterward. He particularly loved baby animals, always taking very good care and being very jealous of the other dogs regarding puppies, kittens, the parrot, and even a rabbit once. Only when he got much older did they seem to become more of an annoyance. We called him Dr. Frosty, and he acted more like the dog Nana in Peter Pan. 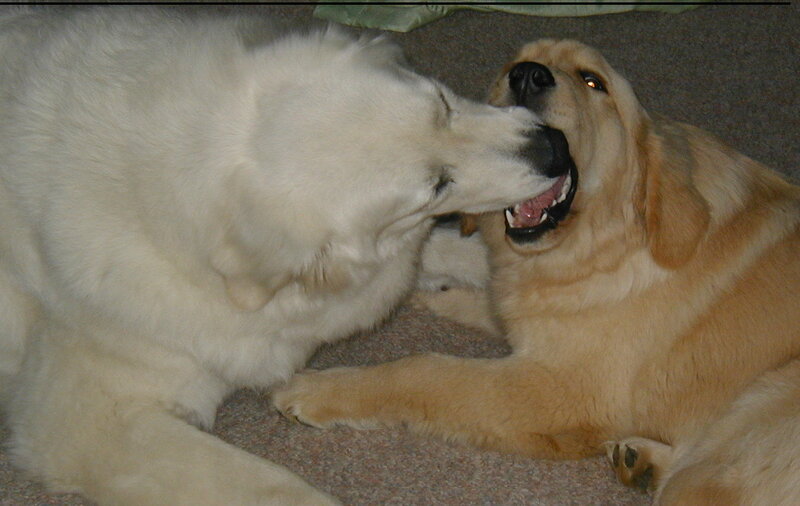 When puppies would start teething, he would become obsessed with their mouths, trying to heal them. If the puppy resisted and did not want Frosty licking all over inside its mouth, trying to squiggle away, Frosty would hold them down with his front leg until he as finished. He would take just as much care with his toys. Throughout his life he was fascinated with stuffed toys, particularly during that most joyous of occasions - dinnertime. But where our other dogs would soon have the carpet covered with stuffing and shattered pieces of squeaky mechanisms, Frosty’s toys would last for years, looking like they came over on the Mayflower, but still being whole and having working squeakers. Now he is gone. Frosty lived to be just older that 14 ½ years, 102 in the ‘dog years’ rubric. For the last few years he had been barely able to get up and about, and as a result spent most of the time laying around with as little effort as possible. Most recently, his bowel control had decreased so it was like having a large shedding Pez dispenser roaming the house (if Frosty could somehow read this, he would be mortified). We had been on a death watch for several years, so much so that it was a running joke that he intended to outlive all of us. But it now seems to be over so quickly, too quickly. It seems so sudden, in spite of our long realization that it was getting near. There is a large white hole in the house. Several of the others, while not sick at his passing like he would have been, are still apparently not comfortable, aware of the change, the loss of Frosty. He is certainly missed, and while the sadness will fade with time, he will be missed well into the future. There are pictures and memories enough to ensure that. Frosty was a good dog, even a great one. A common enough accomplishment, I suppose, but still his greatest honor.